TV Anywhere—multi-screen device ecosystem including Slingbox® retail products, the SlingPlayer® Mobile suite of applications and integrated SlingLoaded® technology. Award Nominations - EchoStar’s innovative Ultra Slim Box and versatile Android™-powered IP STB have both been shortlisted for Cable and Satellite International’s product of the year awards, and the Ultra Slim box has also been nominated for the connected home display device of the year at the Connected World.TV awards. All awards will be announced at IBC. 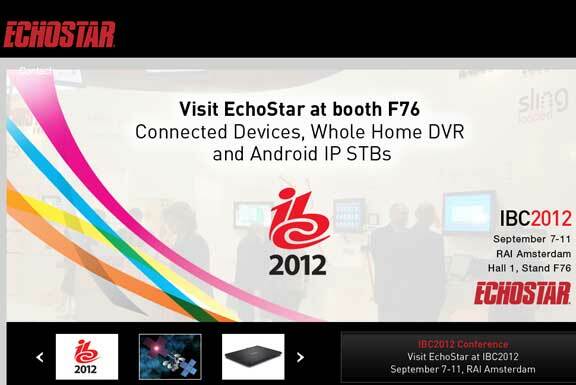 Rhod Williams, senior vice president and general manager of EchoStar in Europe, said, “We have brought together a showcase of inspirational product solutions that have been deployed around the world—highlights include an IP-based Whole Home DVR ecosystem deployed in North America, the slimmest digital TV recorder launched in the UK and an advanced cable DVR supplied to the German pay TV market - our objective is to provide a mix of solutions that offer a roadmap to enable operators to extend services over IP to capture new audiences and retain subscribers”.